Dr. Martina Scholtens spent 10 years caring for newly arrived refugees at Bridge Refugee Clinic. 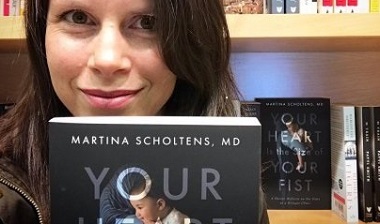 A perfect complement to that gathering is Your Heart is the Size of Your Fist, a new book by Marina Scholtens, MD. Martina Scholtens, now a clinical instructor with the Faculty of Medicine at UBC, has done a remarkable job of describing her 10 years as a doctor at Bridge Refugee Clinic, beginning in 2005. Her day-to-day experience at the clinic was far from what she had trained for at medical school – disease, diagnosis, treatment, referrals. She discovered that her work was often more psycho-social than strictly medical, and found herself, at various times, in the role of a counsellor, an advocate, a spiritual advisor, a nutritionist and a friend. Scholtens wrestles with issues of balance throughout the book, from how she can properly care for her family and friends – and herself – while also worrying about refugees waiting for medical attention, to how to balance personal engagement with professional detachment. Many of her interactions with her patients are touching, though she does not seem particularly sentimental. I was turned away from the computer, facing Yusef squarely. I sat with my feet hooked on the stool footrest, my hands on my legs, shoulders loose. I listened. Over the years at the refugee clinic, I’d cycled through various responses to patients’ stories of trauma. The gamut I had run was wide: voyeuristic fascination with the horrific details; avoidance of patients’ pasts when I became overwhelmed by my powerlessness to change them; feelings of deep shame over being human; detachment, where I could hear a story of torture while noting that it was lunchtime, debating whether to order the black bean soup or the cucumber and gorgonzola sandwich at the deli. Eventually, I simply focused on absorbing patients’ stories. I came to believe in the healing power of bearing witness to suffering, a belief borne partly out of results, partly out of resignation. Go here for an excerpt from the book which includes this portion. I’d run across this sentiment before, in all sort of contexts. “My constituents want their refugee families by Christmas!” I’d heard a mayor say about his small town’s frustrations with delays in the private sponsorship system. “We are in love with our refugee family. Smitten!” wrote a blogger about the Iranian family for which her church was responsible. I call this phenomenon maternalism – the misapplication of motherly sentiments that serve to infantilize the object of care. . . .
An attitude that I frequently encountered outside of the clinic was the expectation that refugees act from a position of obligation and inferiority. . . . Helping affirms capacity, worth and superiority; being helped implies deficiency, burden and inferiority. The helper is owed; the helped is obligated. Providing help, one’s vulnerability is masked, while the other’s is highlighted. Helping others is not necessarily altruistic. . . . When I prepared a presentation on refugee health for a group of private sponsors . . . I made the final slide about the contrast between helper and helped. I wondered whether it was unfair to challenge the motivation of well-meaning volunteers. I needn’t have worried. It was the most well-received part of the presentation, prompting an audience-led discussion of how one might smooth the differences in position of sponsor and refugee. I was relieved. I wanted to encourage their generosity. I just wanted a little dose of self-reflection to accompany it. The furniture had struck me as incongruous when I started at the clinic, but I’d since decided it wasn’t that unnatural a fit. Church and clinic were both places where people gathered to seek answers, sites of congregation and confession. There is a strong Christian undercurrent in this book, though not in a cliched or cloistered way. Your Heart is the Size of Your Fist illustrates what can happen when a child is brought up in a loving, conservative Christian home with a love for learning. I had a secret: I wasn’t working at the clinic because I had a heart for refugees. . . . Having a heart for refugees suggests that one is blessed with divine direction, certainty, and servitude – none of which I felt I could honestly own up to. My career has been a guided drift. ‘Having a heart for’ something is Christian-speak, heard every day in churches around the city – usually sincere, no doubt, but not very original. Scholtens’ ‘guided drift’ can probably be attributed, in part at least, to her upbringing. Right after the ‘heart for refugees’ comment she says she never considered a medical career until she was 21. Then she refers back to her childhood, saying she “grew up in a conservative religious community” in which young women were expected to marry young and have children. If they did go into a profession it would be a traditional one such as teaching elementary school or nursing. She points to the influence of her father, a university professor, but does not add, as she might have, that her Christian Reformed tradition has a tremendous focus on education and on the significance of Christian faith for every aspect of the world we live in. Just the kind of environment, in fact, that might lead one to ‘drift’ into medicine. My childhood revolved around the New Westminster Christian Reformed Church. Grandparents, classmates and neighbours were all part of the same Dutch immigrant community. John Knox Christian School was directly across the street from the church, on 13th Avenue. We lived three blocks away, my grandparents four. On Saturdays, my younger sister and I rode our bikes through the back alleys of north Burnaby with our school friends, collecting walnuts and exploring vacant lots. The next morning, we’d rejoin those same friends at church. I was wrapped in layers of community, snug and safe. I would recreate this community for my own children, if I could bring it back. This is the kind of thing that makes the book so effective. Scholtens remembers her own family’s immigrant experience, which overlaps with, but is also distant from, those of her patients. She appreciates that insular but nurturing world, which has been lost to her – as many of her patients no doubt mourn stable, cohesive cultures from their childhoods. And she does not hesitate to celebrate the ‘white Dutch’ world in the midst of a book which welcomes, cares for and sometimes even celebrates people and cultures from all over the world. A chapter on her interaction with a Congolese woman with AIDS – and the woman’s simple trust in Jesus and his power to heal – offers some profound insights into the nature of faith, the nature of miracles and the ways in which our relationship with God can shift over time. A couple of the most significant messages in Scholtens’ book came through as she was interviewed on CBC Radio’s North By Northwest. I already valued [humility] going into the refugee clinic, but definitely, spending my time there – in medicine itself, but especially working with other cultures – you recognize how little you know. . . . Even the term ‘cultural competence,’ which I think is a bit of a misnomer because it suggests that you can have competency in multiple cultures . . . You can’t master another culture and understand all the nuances unless you’ve been a part of it for an extended period of time. I think the concept of ‘cultural humility’ is a much better one. That’s why I try to teach students, don’t be intimidated by this Syrian family coming in today that you know nothing about. Just go in there, recognize the limitations of what you know, be curious, be respectful, be kind – and that’s enough. That’s all you need. I wanted to write [the book] as a form of advocacy, and I think as a family physician I do have that obligation towards my patients, to advocate for their needs. Refugees come and go in the news; they’ve been in the news quite a bit recently, but I’d noticed that there tend to be two kinds of narratives about refugees. There’s the one where refugees come to Canada by unfair means and try to access the social system here on the backs of taxpayers. And then the counter-narrative is the opposite one where refugees are kind of portrayed as saints, where their actions and motivations cannot be questioned. It was clear to me, working on the frontlines with refugees that neither of those were the case, and it was much more, in one sense more complex, and in another way more simple, because they were just humans like the rest of us. So, I did want to write a book where I could capture that and demonstrate it. And that is exactly what she has done. Your Heart is the Size of Your Fist tells many stories and offers insights into the lives and outlooks of people brought up in very different cultures – and her own life, which as a self-described introvert can’t have been easy. Scholtens is a wise and compassionate guide; reading the book will help anyone who wants to welcome the stranger. How or where can we purchase a copy of Martina Scholten’s book? Tonight? (cash or credit card?) Or online? Regent Bookstore? Do tell… Will there be a book launch, or is this that event? The book can be purchased at Chapters, both online and in store, as well as on Amazon, and at independent bookstores in Vancouver like Black Bond Books and Banyen Books. There will be an event at Banyen Books at 6:30 pm on November 30 where you can meet Martina and get a signed copy. This was a unique and intriguing peek into the world of a family physician and her experiences caring for refugee families while balancing the emotional and psychological demands of her career and family. The stories will expand your understanding of and empathy for newcomers to Canada.